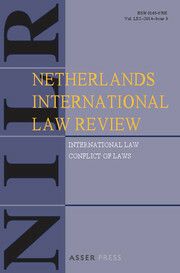 Now Published by Springer The Netherlands International Law Review (NILR) is one of the world’s leading journals in the fields of public and private international law. It is published three times a year, and features peer-reviewed, innovative, and challenging articles, case notes, commentaries, book reviews and overviews of the latest legal developments in The Hague. The NILR was established in 1953 and has since become a valuable source of information for scholars, practitioners and anyone who wants to stay up-to-date of the most important developments in these fields. In the subscription to the Netherlands International Law Review, the Netherlands Yearbook of International Law (NYIL) is included. A special membership rate is available to the members of the Dutch Society of International Law. The NILR is published by T.M.C. Asser Press, in cooperation with the T.M.C. Asser Instituut, and is distributed by Cambridge University Press. T.M.C. Asser Instituut, an inter-university institute for Private and Public International Law and European Law, was founded in 1965 by eight Dutch universities offering programmes in international law. The Institute is responsible for the promotion of education and research in international law, particularly by setting up documentation projects and carrying out research.